The Dead Sea is an inland lake into which the Jordan and Arnon Rivers flow, but which has no exit. It is the lowest spot on the surface of the earth, its surface being about 1,300 ft. [400 m.] below sea level. Its northern end, the deepest (the bottom is another 1,300 ft. [400 m.] down in the northeast corner) is 31 mi. [50 km.] long while its southern, shallower end, is only 15 mi. [24 km.] long. Indeed, because less and less water has been flowing into the Dead Sea its level has been dropping and the whole southern end is almost dry! It is about 5 times as salty as a typical ocean. It is very hot and dry during the summer months (ave. daily high about 95 degrees F [35 C]. Salt from the sea was used to preserve meats, and its bitumen lumps were used to caulk boats, for mummification, and for to assist in treating skin diseases. The major freshwater sources are the springs at En Gedi (on the western shore) and the Arnon River on the eastern shore. 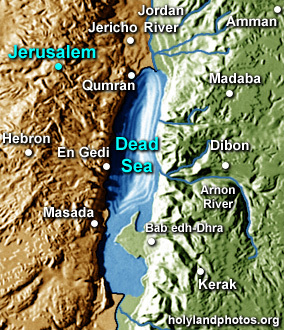 In the Bible it is known as the “Salt Sea” and the “Sea of the Arabah.” Today it is called, in English at least, the “Dead Sea,” for very few life forms can survive in its waters.